Phellodendron amurense is a tree to 15 m. tall, branching low, bark light gray, with small, prominent pale lenticels, corky on older trees, deeply fissured, under-bark bright yellow or greenish yellow, older twigs yellowish, crushed foliage aromatic-foul-smelling; winter buds 2-scaled, covered with reddish silky hairs, enclosed by base of leaf stalk. Leaves opposite, pinnately compound, stalk broad-based leaving a oblong, or horse-shoe-shaped, vaguely 3-lobed scar with bud between upper lobes; blade about 30 cm long, 5-11 leaflets, 8-10 cm long, tip long-pointed (acuminate), base rounded, dark green, shiny above, mostly hairless below, margins entire (Dirr 1990, Rehder 1990). 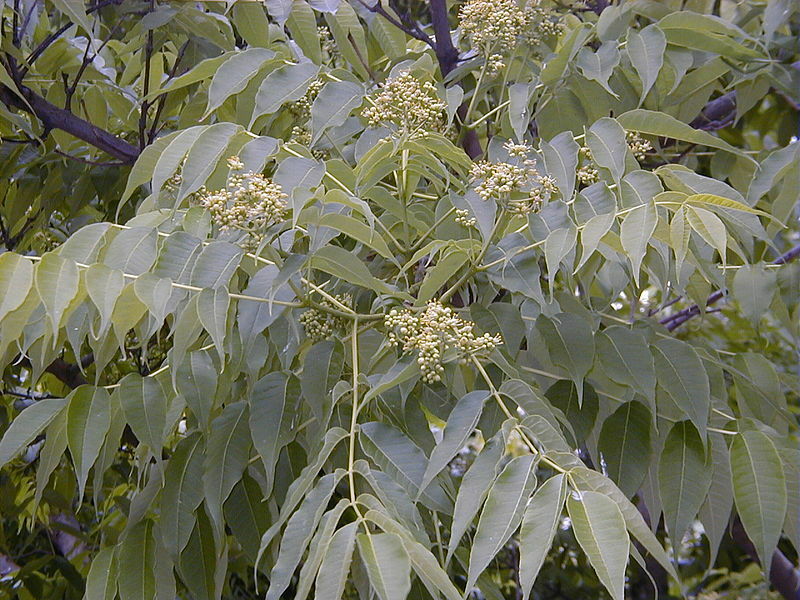 Phellodendron amurense.flowers,buds & leaves.commons.wikimedia.org (Accessed 3/2016). Flowers yellow-green, ca. 0.6 cm long, sexes on separate trees (dioecious), in small branched clusters (panicles) May-June (Dirr 1990, Rehder 1990). 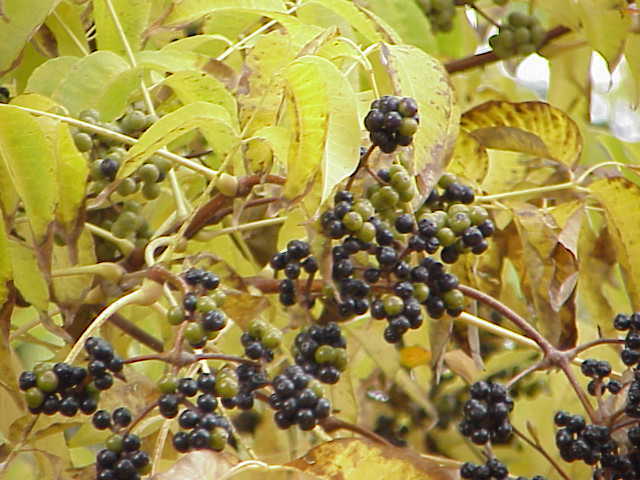 Fruit black, fleshy, 1 cm wide, rounded, 1-seeded, strong turpentine odor when bruised, persistent through winter, pulp lipid <10%, (White and Stiles 1992), fruit eaten by American robins (Lamont and Young 2002), which disperse seeds (Dirr 1990, Rehder 1990). Habitat: Ornamental sometimes escaping and becoming invasive in forest understories, shade tolerant, displaces native shrubs and trees. Found on soil with pH 5.2 (Kruzanski and Kushnir unpublished data).